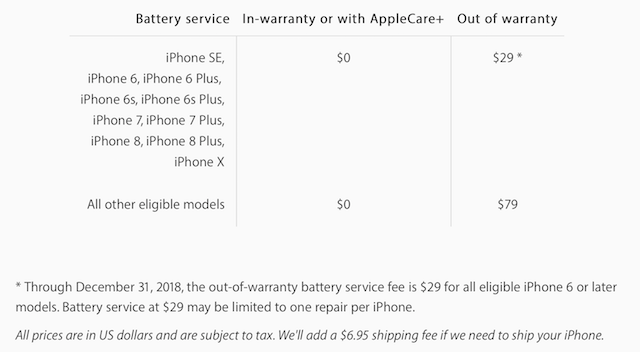 As noted by the folks over at MacRumors, Apple has confirmed through a fine print on its iPhone service pricing page that its ongoing $35 CAD battery replacement offer for any iPhone 6 or newer device regardless of its diagnostic test result, may only be redeemed once per iPhone. Any additional $35 battery replacements will require the device to fail Apple’s diagnostic test to qualify. If the test passes, a customer can still choose to have the battery replaced, but Apple’s standard $79 fee applies. Apple says iPhone batteries are designed to retain up to 80 percent of their original capacity at 500 complete charge cycles, and this is likely the primary benchmark for its diagnostic test, but results may vary. Although, it is highly unlikely that iPhone users would need to have their iPhone battery replaced more than once in a year, any customers who might be planning to taking advantage of the $35 deal now, and then again near the end of 2018, should find themselves out of luck.